The synergistic effect the “quiet” and the “movement” attained. We have designed a slim low impact body with high density. 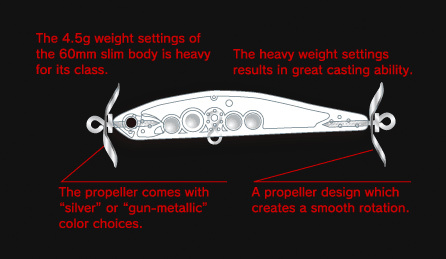 The lure is equipped with a straight action while the fine tuned angle and size of the propeller creates a pulsating effect. The 60mm slim body has been loaded with a total body weight of 4.5g. This heavy weight settings has provided it a casting ability unimaginable from its body size. 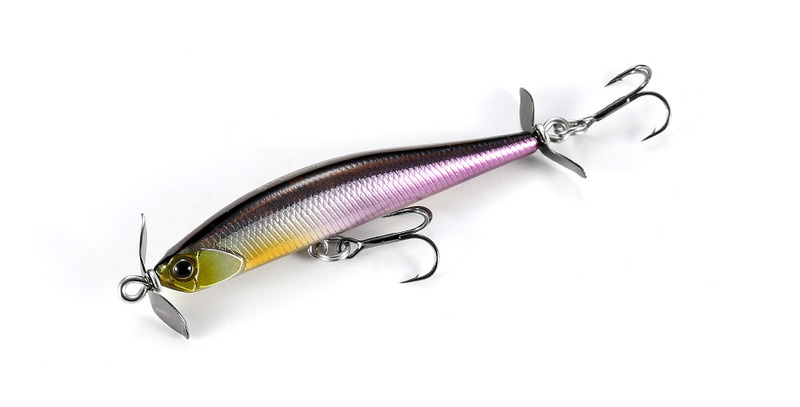 Although the lure body has a straight action, the rotation of the propellers at the front and rear of the lure creates a wake and strong flashing effect attracting the target. The fish attracted to wake and flashing of the propeller will bite without hesitation with its realistic slim body.